Daniel Thompson at The Barbara Hepworth museum in St.Ives, Cornwall (with a cat) - photo by Anna Lucey. 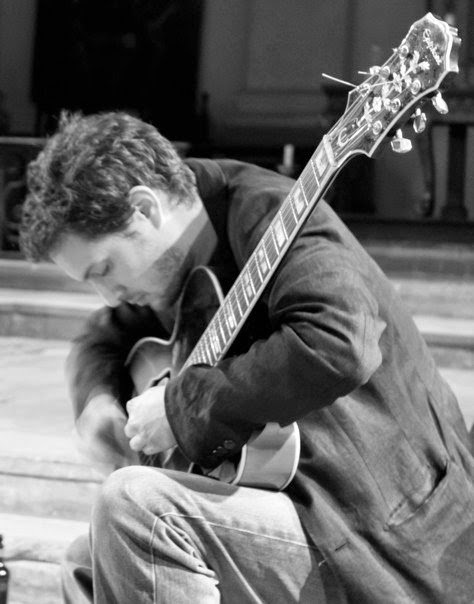 Daniel Thompson is a guitarist and improvising musician currently living in Hackney, London. He was born in Norfolk, England in 1981 and other than a couple of years playing violin as a child, his musical studies didn’t seriously begin until his late teens. Largely self-taught, after moving to London in 2006 Daniel embarked upon a life changing period studying with the guitarist John Russell for two years, who “provided me with one of the richest and most rewarding musical experiences of my life”. A part of the fertile London improvising music scene Daniel has also played at many other venues across the UK and Europe. 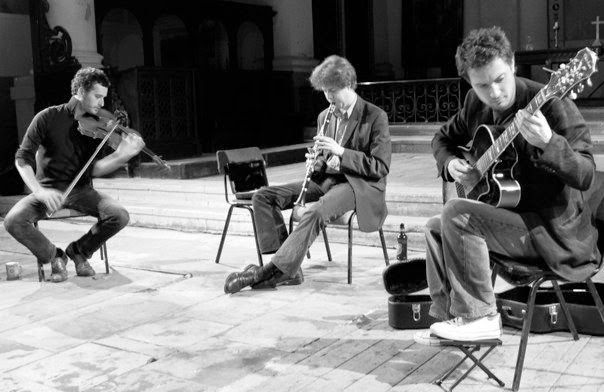 As well as being a musician Daniel has been organising concerts since 2007 and his monthly improvised music concert series entitled ‘Foley Street’ takes place in London’s west end. As well as performing solo and with other musicians in many ad-hoc improvising situations Daniel also performs in long-term collaborations or “working groups”. Recent collaborations (both ad-hoc and long-term) have seen Daniel performing with Neil Metcalfe, Benedict Taylor, Adam Bohman, Simon Rose, Ricardo Tejero, Steve Noble, Alex Ward, Phil Durrant, Kay Grant, Roland Ramanan, Mark Sanders, Terry Day, Anton Mobin, Tom Jackson, Julie Kjaer, Javier Carmona and Guillaume Viltard amongst many others. Other than the superficial elements of the instrument (a shoreline gold squire stratocaster), my longest remaining memory is simply how difficult I found it to play the instrument. Not feeling at all like a natural guitarist this is a problem I still deal with daily. It presents an added challenge which part of me obviously desires as I have been working out how to play the instrument (a different guitar now) for quite sometime and I imagine I will still be trying to work it out for the rest of my musical life. Why do you pick up the guitar? The aforementioned challenge in the answer to question 1 is probably the biggest reason. If I am proud of any of my work then it would be my most recent collaborations as they represent who and where I am at this present moment. I am proud of my tenacity in continuing to work hard on my instrument, particularly when I don't feel up to it (this attitude/approach benefits tremendously from the continuing support of a very close loved one). I don't feel as though I need anything in particular from music other than for it to simply be there. As a permanent student of music it has and will keep me very busy for the rest of my life. The Arts play a very important part in my life and they continue to influence and inspire me. Painting, sculpture and film in particular are very closely related to my work as a musician, exactly how they are related I am still trying to figure out. I do not practice any other artistic discipline although the threat to paint or sculpt does raise its head every now and again. Sennheiser e914 cardioid condenser external mic. I must admit that this balance is always in a state of flux as the attempt to try and amplify the acoustic sound of any instrument seems to me like an eternal headache! I have received lots of valuable advice from many different people over the years and I would not want to single one piece out over another. I was very lucky to grow up in a musical household and I played violin for a couple of years when I was a child which I seem to remember enjoying. I started learning the guitar and seriously studying music in my late teens and practiced hard. I don't have a conventional performance background of playing jazz, classical, rock, blues etc, although all these musics have and are of immense interest to me, both through study and listening. I do remember always being fascinated with the guitar and wanting to explore the instrument. I made the discovery of knowing that I wanted to play free improvisation at a relatively early stage and this was only confirmed after hearing the Evan Parker trio with John Edwards and Tony Marsh when I moved to London in my early twenties. 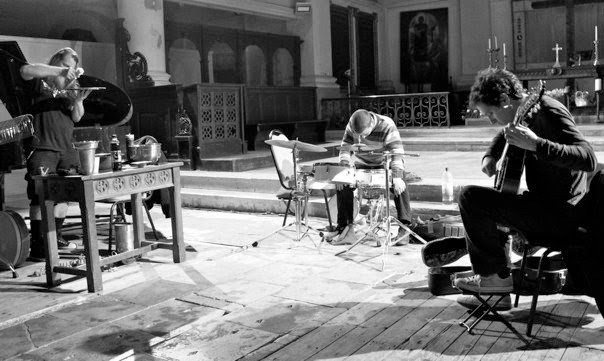 Not being part of a conservatory/university musical environment I was largely self taught until I met and heard John Russell for the first time at a gig he was playing with Evan Parker, Ken Vandermark and Phil Wachsmann in London. After the gig we discussed (amongst other things) the possibility of me visiting him for lessons. About a year passed before we got together and I ended up studying with John for about 2 years. A musically rich and rewarding experience and one I will never forget. John is a generous and warm human being and a wonderful musician and teacher, he always seemed to know what I needed to know before I knew it but he would never actually tell me what it was. Instead he would guide me in the right direction allowing me to make the discovery myself. It was revelatory to me and a truly pivotal period in my musical life. The musicians I have been lucky enough to collaborate with have, and continue to be the most significant influence on me. The list of music heard both live and recorded which has been an influence on me would be exhaustive. Fundamentally, anything can and has been an influence and can sometimes come from the strangest and most unlikely of places. Not one musical work as such, but almost as soon as I moved to London I went to hear the aforementioned Evan Parker trio with Tony Marsh on drums and John Edwards on bass at The Vortex. This was confirmation that music was what I wanted to dedicate my life to and specifically to playing freely improvised music. Not only was the music staggeringly good but I distinctly remember hearing the way in which the music was constructed, unselfishly, not only with the other musicians of the trio but also with the audience. I came away from the concert wanting to be part of something similar. It was literally a life changing experience. Working almost exclusively within free improvisation and talking to musicians from the 'older' generations of this music I am aware that there are far more people playing this music than ever before. I can't see this as anything other than a good thing and I feel extremely lucky to be making music in this time period. Each individual instrument presents its own challenges. I am far more interested in the music being made than what type of instrument the music is being played on. To my understanding Charlie Parker made some ridiculously good music playing on some pretty "awful" horns and there is an incredible cd by the Spontaneous Music Ensemble called Bioystem with Roger Smith playing a very cheap, "bad" guitar he had to buy from Woolworths (a now liquidated English high street shop) just prior to the session and the music he makes sounds great! Good or bad instruments, somedays they love you, somedays they hate you! Talk me about your work as improviser. I play freely improvised music in both ad-hoc and long term musical relationships. As an extension of my work as an improviser I am also an organiser of concerts. My most recent concert series entitled Foley Street is a monthly evening which exclusively explores free improvisation and gives myself and many other national and international musicians a platform to explore there own music. The concerts take place above a pub in London's West End. I have recently released a duo cd with the flautist Neil Metcalfe entitled 'Eight Improvisations' and is released on Creative Sources records. I have within the last month recorded with Tom Jackson (clarinets) and Benedict Taylor (viola) and we will be looking to release this material later in the year. I have a trio cd due for release anytime now on Leo Records with Tom Jackson and Roland Ramanan (trumpet). Two recordings are also seeking release with Anton Mobin (chamber box), one in duo and another in a trio with the percussionist Naoto Yamagishi. April 2014 will see me playing with saxophonist Simon Rose and drummer Andrew Lisle in a trio, with TripTik (Adam Bohman, Adrian Northover & Catherine Pluygers) in a quartet, in a duo with Neil Metcalfe to promote and launch our new cd and in a quartet with Tom Jackson, Benedict Taylor and Jean Michel van Schouwberg. I will continue to organise/curate Foley Street which is a monthly improvised music concert series.